Spanish giants FC Barcelona endured a mixed 2015-16 campaign after winning the league and cup double but faltering on the European stage against a familiar foe. The campaign also saw the Catalans winning the FIFA Club World Cup and the European Super Cup, taking their overall trophy count to four for the season. The attacking fluency of Barcelona in the final third was once again the highlight of the campaign for most Blaugrana fans. Barcelona scored a staggering 112 goals in the league this season – averaging almost 3 goals a game. 40 of them were scored by striker Luis Suarez, who became the first player, other than Messi and Ronaldo, to win the Pichichi award since Diego Forlan won it in 2009. Let us look back at some of the key moments of Barcelona’s 2015-16 double winning campaign. Barcelona clinched the La Liga title on the final day of the league campaign after registering a 3-0 win away at Granada, keeping them a solitary point ahead of bitter rivals Real Madrid. Barcelona won their opening 4 matches of the league campaign, which included a 2-1 win against Atletico Madrid at the Vicente Calderon. Barcelona’s trip to Estadio Balaidos on 23rd September ended in humiliation as they were thumped 4-1 by Celta Vigo, courtesy of a Nolito masterclass. The following week, Barcelona’s 2-1 win over Las Palmas at the Camp Nou came at a cost as Lionel Messi picked up a serious knee injury which would keep the Argentine magician out of action for 8 weeks. A week later, Sevilla deepened Barcelona’s misery with a 2-1 win over them at the Ramon Sanchez Pizjuan in early October. From then on, Barcelona went on an astonishing 39 match unbeaten streak in all competitions – a run which saw them open up a massive 12 point lead over their nearest league rivals in March. The result which most appropriately epitomized Barcelona’s relentless charge to the La Liga title during the unbeaten run was their 4-0 slaughtering of Real Madrid in the first Clasico of the season. With Lionel Messi on the bench, Luis Suarez and Neymar ran riot at the Santiago Bernabeu to inflict a humiliating defeat upon Los Blancos in front of their own fans. Barcelona let slip a two goal lead to draw 2-2 against Villarreal at El Madrigal in late March to drop their first points in the league since early January. Overwhelmed by the passing away of club legend Johan Cruyff, Barcelona lost at home to Real Madrid in the second Clasico of the season to sow the first seeds of doubt in the minds of its players and supporters. Subsequent defeats to Real Sociedad and Valencia in early April saw Barcelona’s lead at the top of the table cut to zero points and left them no margin for error. Notably, Barcelona had been playing 3 matches in a week for 3 months straight prior to their remarkable late season collapse. However, an astonishing end of season run witnessed Barcelona score 24 goals in their final five matches to seal their 24th La Liga crown. Manager Luis Enrique used the Copa Del Rey to give a run out to some of Barcelona’s youth players, including several graduates from their much fabled La Masia. Thumping 6-1 aggregate wins over Villanovense and Espanyol kicked off Barcelona’s defence of their Copa Del Rey crown in perfect fashion. The Blaugrana’s quarter final match against Atheltic Bilbao proved to be a more sterner test as they battled to a 2-1 win at the Nou San Mames in the first leg. However, a 3-1 win at the Camp Nou ensured their progress into the semi finals of the tournament, where Gary Neville’s struggling Valencia awaited them. A 7-0 mauling of Los Che at the Camp Nou effectively ended the two legged tie as a contest and secured Barcelona’s place in the final of the tournament, to be played on 22nd May at the Vicente Calderon against Sevilla. With both teams in a buoyant mood following their respective league and cup triumphs the previous week, the final at the Calderon made for a highly entertaining affair. Barcelona’s Javier Mascherano was sent off in the first half to reduce Barcelona to 10 men with almost an hour left to play in normal time. However, Sevilla were unable to capitalize on the one man advantage during regulation time as the match headed into extra time. With Sevilla’s Ever Banega sent off, both teams played 30 minutes of extra time with 10 men each. Two magical passes from Lionel Messi set up Jordi Alba and Neymar to score past Sevilla keeper Sergio Rico and hand Barcelona their 28th Copa Del Rey trophy. Barcelona were unable to become the first team in the Champions League era to successfully defend their European title as they crashed out of the competition in the Quarter Finals. Placed with AS Roma, Bayer Leverkusen and BATE Borisov, Barcelona easily made it out of the group after recording 4 wins and 2 draws in their 6 matches. A 6-1 thumping of Italian giants AS Roma was the most eye catching result of Barcelona’s Champions League group campaign. In the Round of 16 draw, Barcelona were paired with English club Arsenal. A Lionel Messi masterclass saw the Catalans register an impressive 2-0 win at the Emirates stadium in the first leg of the knockout clash. A 3-1 win in the second leg at the Camp Nou, courtesy of goals from Messi, Suarez and Neymar, sent Arsenal crashing out of the competition and ensured Barcelona’s smooth progress into the quarter finals. 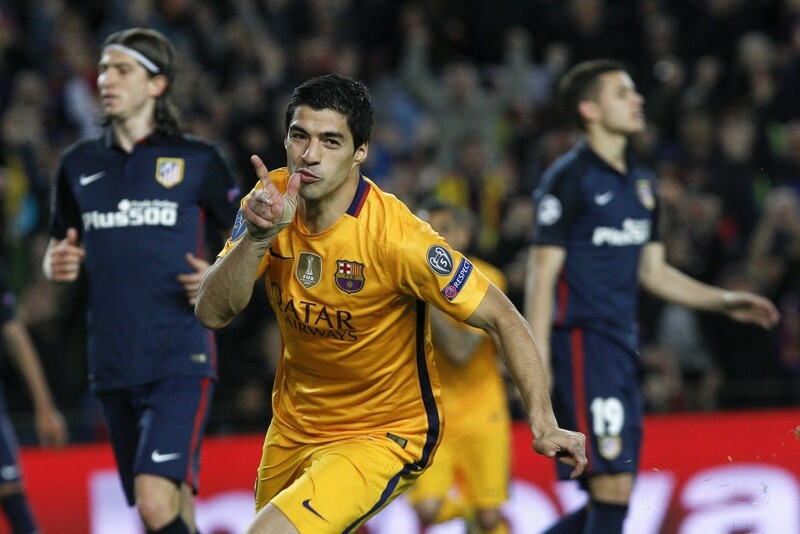 Familiar foes Atletico Madrid awaited Barcelona in the next round. A feisty first leg at the Camp Nou saw Atletico Madrid take the lead through Fernando Torres’s first half strike. 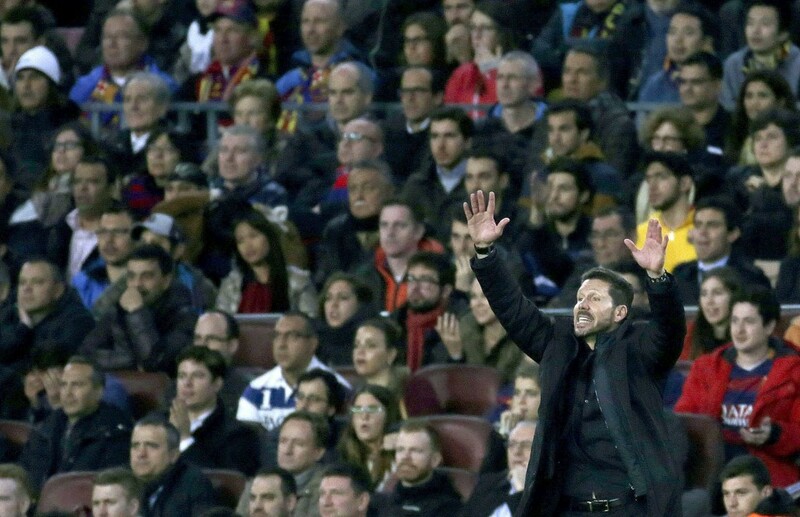 Soon after, Torres was shown a second yellow after tripping Sergio Busquets to send Atletico down to 10 men. After defending heroically for most of the match, Atletico Madrid finally crumbled as Luis Suarez struck a second half brace to give the Catalans a narrow lead going into the second leg. Two goals from Antoine Griezmann at the Vicente Calderon condemned Barcelona to an early exit from the tournament at the hands of their La Liga rivals. Luis Suarez was undoubtedly Barcelona’s player of the season after hammering 59 goals in all competitions past opposition defences. Suarez also broke the Messi-Ronaldo duopoly in La Liga to win the Pichichi award after scoring an astonishing 40 goals in the league last season. With Messi missing in action for a couple of months due to injury and Neymar having an underwhelming campaign, Suarez was burdened with carrying the weight of Barcelona’s hopes and aspirations during the season. He more than justified his 65 million euros price tag by coming up with important goals whenever his team needed them. Winning the domestic double would not have been possible without the prolific goal scoring abilities of El Pistolero. By his lofty standards, Neymar had a slightly underwhelming 2015-16 campaign. However, his rainbow flick and finish against Villarreal in early November gave the Camp Nou faithful a reminder of the audacious skills possessed by the mercurial Brazilian.